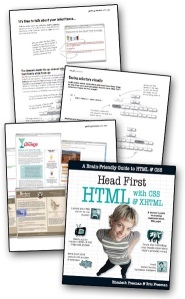 The Head First crew has just released their latest in the phenomenally successful HF series, Head First HTML with CSS & XHTML. Check out the sample chapter PDF for Chapter 8, a first intro to “styles”. For example, they put speech bubbles and handwritten notes in the text; they use a page layout which is best described as "freeform"; they add puzzles; they challenge your understanding with questions from left-field; and they dare to switch your brain’s activities from left to right and back again. In short they get you involved in what you’re reading, so the subject matter just kind of soaks into your brain and (for the most part) stays there. A large part of the reason their books work so well is because they’re fun to read. A computer book that’s fun to read? Heresy! (Highly recommended of course, partly for that reason).